Infographic: who is my customer? I want to start a business: how do I do it? "To love what you do and feel that it matters – how could anything else be more fun?" Teresa Coffey, business owner, RTW. 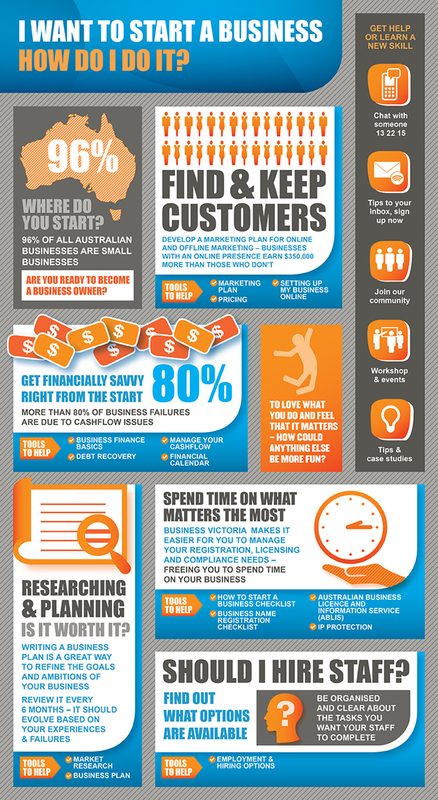 Did you know that 96 per cent of all Australian businesses are small businesses? Develop a marketing plan for online and offline marketing – businesses with an online presence earn $350,000 more than those who don't. Make sure your business is making a profit – more than 80 per cent of business failures are due to cashflow issues. Researching and planning: is it worth it? Writing a business plan is a great way to refine the goals and ambitions of your business. Review it every six months – it should evolve based on your experiences and failures. We make it easier for you to manage your registration, licensing and compliance needs – freeing you to spend time on your business. Be organised and clear about the tasks you want your staff to complete – find out what options are available before you start hiring.